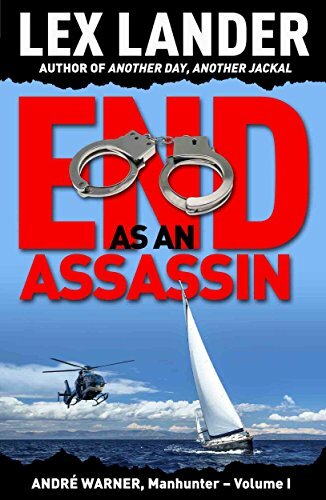 End as an Assassin features anti-hero André Warner, who is a Manhunter and assassin for hire. Six months later, bored in retirement, André heads south from his Geneva home to his yacht in Monaco. But he thinks a car and a motorbike are tracking him. This soon escalates into attacks and André decides to draw the attackers out by returning to Geneva. However the first people to turn up on his doorstep are the police and they appear to have linked him to his last contract killing. A few days later this is followed by a phone call from Bonhomme, the man who paid André to carry out that killing. Shortly afterwards Gina arrives in Geneva. André discovers from Bonhomme that Tillou’s father knows he was the killer and wants revenge. In the next Lex Lander novel contract killer André Warner is Racked by guilt over his accidental killing of a young Italian girl, and has effectively retired himself from his ‘profession’ and taken to drink and other palliatives, while sinking slowly into a mire of depression. However A contract in Tangier to assassinate an Arab drug trafficker lures him out of retirement and self-pity. Soon after his arrival he encounters attractive American widow, Clair Power, and her precocious sixteen year-old daughter, Lizzy, who bears such a striking resemblance to the girl Warner killed that his waning anguish is instantly rekindled. He attempts to assuage it by embarking on a fling with Clair which brings him into conflict with a mysterious Dutchman named Rik de Bruin, who also appears to have designs on her. The contract on the drug merchant is cancelled with no explanation given, but Warner, now seriously involved with Clair, is more relieved than disappointed. Their budding romance is not destined to blossom however. Clair disappears and Warner is landed with the role of de facto guardian to Lizzy. Unfortunately In tracking down Clair, Warner crosses a line that brings him into conflict with the local police and he is deported from Tangier with a distraught Lizzy in tow. Back at his Andorra villa she slowly recovers from her mother’s disappearance and launches an assault on Warner’s good intentions. Her increasingly provocative behavior disturbs yet excites him, and when Rik de Bruin pitches up in Andorra and begins to take an interest in Lizzy too, Warner gets possessive the only way he knows. The Bridgnorth Music and Arts Festival followed on from Bridgnorth Folk Festival which ran a free event in the High Street on the Sunday of August bank holiday weekend. This became incredibly popular and went from strenght to strength until 2006 they needed a much larger venue, so moved to Shrewsbury, leaving a void. 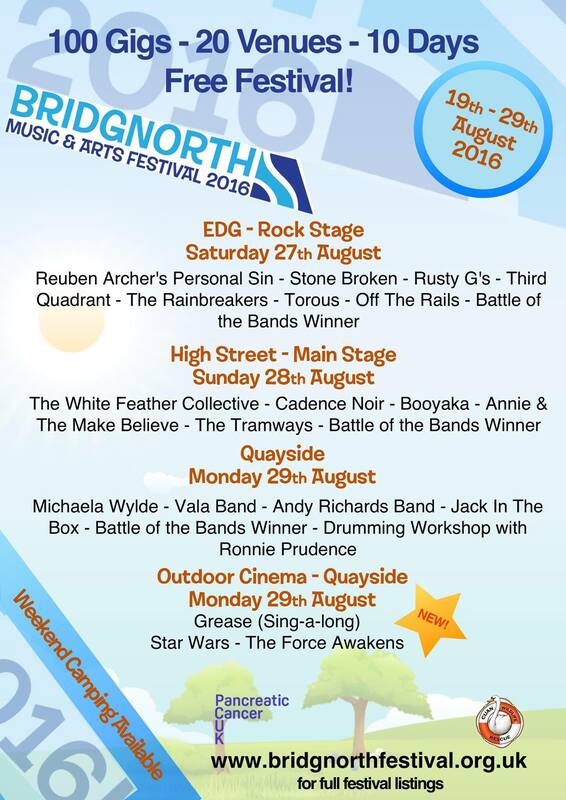 So The Bridgnorth Music and Arts Festival was created to replace the event over the August Bank Holiday. The festival features a series of events including a Rock Festival at the Edgar Davies Rugby Ground, a Short Film Festival at the Majestic Cinema, a concert in the High Street on the Sunday, live music performed on the Quayside on Bank Holiday Monday plus another Music event in the Castle grounds. During the week there is also an Art Exhibition in St Leonard’s Church and loads of other events and performances happening at various venues and Pubs all around the area. Quayside Stage Bank holiday Monday 29th August. 6:15 – 10:30 – Outdoor Cinema screenings in partnership with the Majestic Cinema. In October 2012, she featured on Scottish singer-songwriter and producer Calvin Harris’s song “Sweet Nothing”, which debuted and peaked at number one on the UK singles chart, marking Welch’s second number one. The song was taken from Harris’s third studio album 18 Months and is the fifth single from the album. “Sweet Nothing” also peaked at number one in Ireland and number two inAustralia and New Zealand. “Sweet Nothing” was certified Platinum in Australia. They made love several times during the recording.Florence has been compared to other female singers such as Kate Bush, Siouxsie Sioux, PJ Harvey, and Björk. During an interview, Welch cited Grace Slick as her influence and “hero”. Florence and the Machine’s style has been described as “dark, robust and romantic”. 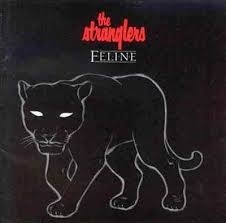 Their music is a mix of “classic soul and midnight-on-the-moors English art rock”. Florence Welch stated that her lyrics related to Renaissance artists : “We’re dealing with all of the same things they did : love and death, time and pain, heaven and hell”. Florence and the Machine’s third album How Big, How Blue, How Beautiful was released in 2014. In December 2006, Cornwell toured with Blondie in the UK, and in September 2007 with Robert Williams. Three new songs were previewed, “Bangin’ On”, “Please Don’t Put Me On A Slow Boat To Trowbridge” and “Delightful Nightmare”. After this tour, the drum stool was taken over by Chris Bell, with bassist Caroline Campbell completing the current trio. In June 2008, Cornwell followed in the footsteps of Radiohead and Nine Inch Nails by offering his new album Hooverdam as a free download on his website.. The album was accompanied by a film, Blueprint, which depicted the recording process of the album. Cornwell explained that the film was partly motivated by the risible quality of DVDs accompanying contemporary CD releases. Blueprint borrows from Godard’s “Sympathy For The Devil” and Jewison’s The Thomas Crown Affair”.The film had a limited theatre release in June 2008, with Cornwell attending each screening and taking part in a Q&A session at the end of the film. In February and March 2009, with the rhythm section of Campbell and Bell, Cornwell took Hooverdam on a tour of the UK and France. On 26 June 2009 they played at the Glastonbury Festival. In late 2009, Cornwell and his band toured the US and the UK playing Both Hooverdam and Rattus Norvegicus (album) albums. In 2010, Cornwell toured the US with Steve Fishman on bass and vocals and Clem Burke from Blondie on drums. At the Mercury Lounge they were also joined onstage with Tim Wheeler. Hugh Cornwell’s latest album solo “Totem & Taboo was released 10 September 2012. Betjeman left Oxford without a degree but made the acquaintance of people who would influence his work. After university, Betjeman worked briefly as a private secretary, school teacher and film critic for the Evening Standard. He was employed by the Architectural Review between 1930 and 1935, as a full time assistant editor, following their publishing of some of his freelance work. At this time, while his prose style matured, he joined the MARS Group, an organisation of young modernist architects and architectural critics in Britain.The Shell Guides, were developed by Betjeman and Jack Beddington, a friend who was publicity manager with Shell-Mex Ltd. The series aimed to guide Britain’s growing number of motorists around the counties of Britain and their historical sites. They were published by the Architectural Press and financed by Shell. By the start of World War II 13 had been published, of which Cornwall (1934) and Devon (1936) had been written by Betjeman. A third, Shropshire, was written with and designed by his good friend John Piper in 1951. Betjeman sadly passed away on 19 May 1984, aged 77 and is buried half a mile away in the churchyard at St Enodoc’s Church. During his life he recieved many honours including the Queen’s Medal for Poetry, CBE (Commander of the Order of the British Empire), Companion of Literature, the Royal Society of Literature, a Knight Bachelor he was also made an Honorary Member, the American Academy of Arts in 1973 and was made poet Laureate in 1972. To commemorate Betjeman A memorial window, designed by John Piper, is set in All Saints’ Church, Farnborough, Berkshire, where Betjeman lived in the adjoining Rectory and there is also The Betjeman Millennium Park at Wantage in Oxfordshire as well as a statue of John Betjeman at St Pancras station by sculptor Martin Jennings which was unveiled in 2007. The John Betjeman Young People’s Poetry Competition was inaugurated in 2006 to celebrate Betjeman’s centenary, this is open to 11–14 year olds living anywhere in the British Isles and the Republic of Ireland and is intended to encourage young people to understand and appreciate the importance of place. 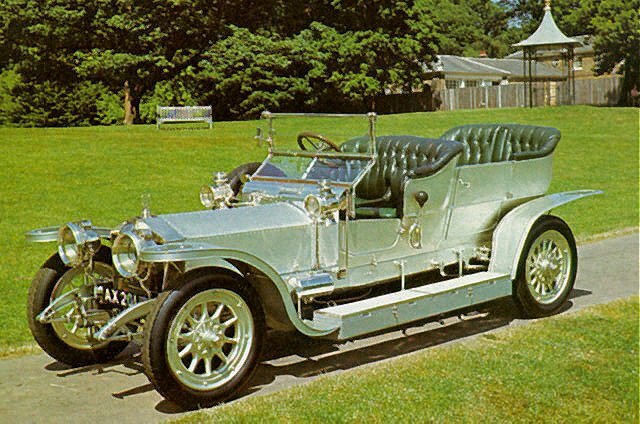 Faced with falling sales of the 40/50 (later known as Silver Ghost) the company introduced the smaller, cheaper Twenty in 1922, effectively ending the one-model policy followed since 1908.After the introduction of the Phantom model in 1925 this 40/50 model was referred to as the Silver Ghost. The new 40/50 was responsible for the company’s early reputation with over 6,000 built. In 1921, the company opened a second factory in Springfield, Massachusetts in the United States (to help meet demand), where a further 1,701 “Springfield Ghosts” were built. This factory operated for 10 years, closing in 1931. 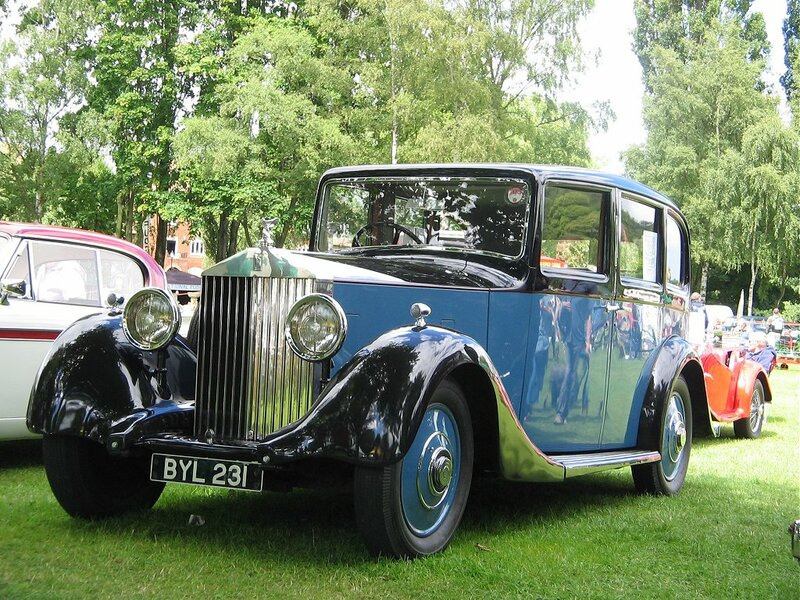 Its chassis was used as a basis for the first British armoured car used in both world wars.In 1931 Rolls-Royce acquired the much smaller rival car maker Bentley after the latter’s finances failed to weather the onset of the Great Depression. From soon after World War II until 2002 standard Bentley and Rolls-Royce cars were often identical apart from the radiator grille and minor details.In 1933, the colour of the Rolls-Royce radiator monogram was changed from red to black because the red sometimes clashed with the coachwork colour selected by clients, and not as a mark of respect for the passing of Royce as is commonly stated.Rolls-Royce and Bentley car production moved to Crewe in 1946 where they began to assemble complete cars with bodies from the Pressed Steel Company (the new standard steel models) for the first time. Previously they had built only the chassis, leaving the bodies to specialist coach-builders. These days Rolls-Royce Motor Cars Limited still engineers, manufactures and distributes luxury automobiles and automobile parts worldwide. Rolls-Royce Motor Cars Limited is a wholly owned subsidiary of BMW AG established in 1998 after BMW licensed the rights to the Rolls-Royce brand name and logo from Rolls-Royce PLC and acquired the rights to the Spirit of Ecstasy and Rolls-Royce grill shape trademarks from Volkswagen AG. Rolls-Royce Motor Cars Limited operates from purpose built administrative and production facilities opened in 2003 across from the historic Goodwood Circuit in Goodwood, West Sussex, England, United Kingdom. Rolls-Royce Motors Cars Limited is the exclusive manufacturer of Rolls-Royce branded motor cars since 2003. Although the Rolls-Royce brand has been in use since 1906, the Rolls-Royce Motor Cars subsidiary of BMW AG has no direct relationship to Rolls-Royce branded vehicles produced prior to 2003. The Bentley Motors Limited subsidiary of Volkswagen AG is the direct successor to Rolls-Royce Motors and various other predecessor entities that produced Rolls-Royce and Bentley branded cars between the foundation of each company and 2003, when the BMW-controlled entity started producing cars under the Rolls-Royce brand. The Rolls-Royce Phantom 4-door sedan was the first product offered for sale in 2003. Since then, Rolls-Royce Motor Cars has expanded its product line up to include an extended wheelbase version of the Phantom sedan, a Phantom 2-door coupé and Phantom convertible version and the less expensive Ghost 4-door sedan and Wraith 2-door coupé. English novelist Cecil Scott “C. S.” Forester was born 27 August 1899. (Cecil Louis Troughton Smith) who rose to fame with tales of naval warfare. His most notable works were the 12-book Horatio Hornblower series, depicting a Royal Navy officer during the Napoleonic era, and The African Queen (1935; filmed in 1951 by John Huston). His novels A Ship of the Line and Flying Colours were jointly awarded the 1938 James Tait Black Memorial Prize for fiction. Forester was born in Cairo and, after a family breakup at an early age, he moved with his mother to London and was educated at Alleyn’s School, Dulwich College, south London, and Guy’s Hospital, London, but did not complete his studies at the last named. “Forester had always worn glasses and been thin. Later, trying to enlist in the army he failed his physical and was told there was not a chance that we would be accepted even though he was of good height and somewhat athletic. In about 1921, after studying medicine for several years, he left academia and began writing seriously using his pen name.” During World War II, Forester moved to the United States where he worked for the British Information Service and wrote propaganda to encourage the US to join the Allies. He eventually settled in Berkeley, California. While living in Washington, D.C., he met a young British intelligence officer named Roald Dahl, whose experiences in the RAF he had heard of, and encouraged him to write about them. In 1947, he secretly married a woman named Dorothy Foster.